CLASS INFORMATION: Ann regularly offers classes in her Battleground Studio as well as occasionally teaching at art galleries around the area. Below is a description and registration information for all classes taught in Ann’s studio. For classes taught in galleries, additional information or links are provided by the class date. Beginning Fused Glass Landscape in the Battleground Studio information: Two-day classes are from 9:00-5:00 on the first day. On that day, students will receive demonstration and hands-on instruction in fused glass technique, and they will lay out their pieces to be fired. Students will come back a second day to come back and cold work/finish their pieces after they have been fired. If a second date is not specified, students will schedule their cold working day with Ann. Cost: Through the end of June, class fee is $225, includes materials, firing, and cold working. Beginning in July 2014, the class fee goes up to $265. To register for a class in the Battleground Studio, contact Ann Cavanaugh directly by email at ann.fusion@gmail.com or call her at (360)606-6191. Remember the second day is about 3 hours and can be scheduled at a mutually convienent time. Mid-week classes are often available upon request. 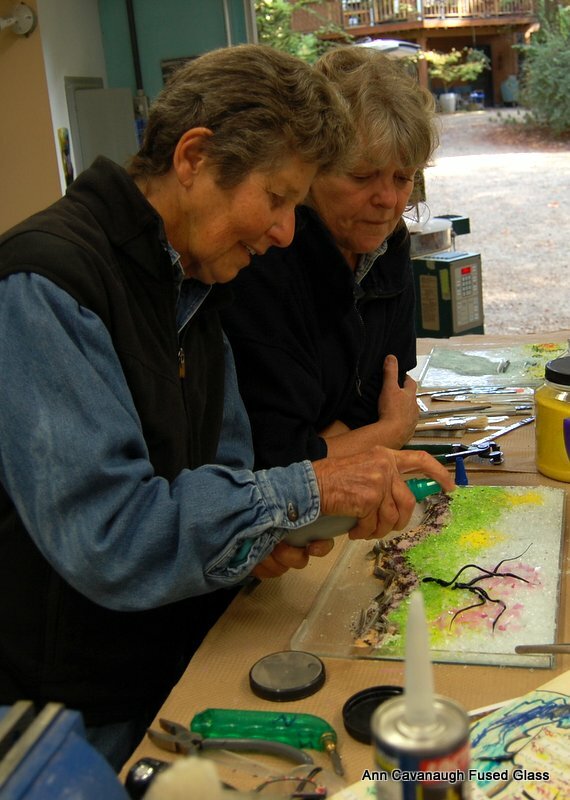 Ann also offers private instruction to accomplish specific projects using kiln work, casting, pate de verre, and more. Email her at ann.fusion@gmail.com for more information. Student Work from Beginning Landscape class. 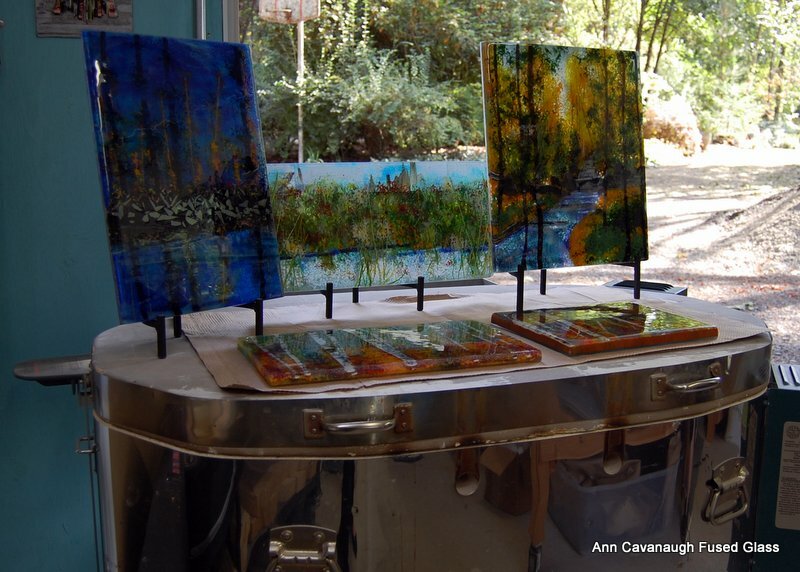 Ann Cavanaugh has a long history as a teacher, first in a public school classroom, then sharing her skills and talents in the medium of stained and then fused glass. 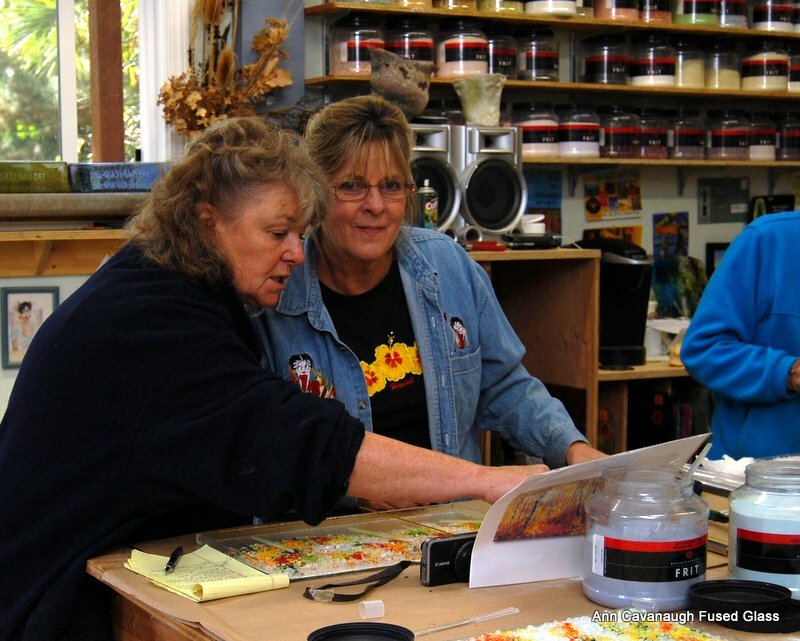 Ann teaches classes both at her beautiful studio on five acres in Battleground, WA as well as in local galleries. View the listings below for currently scheduled group classes, or contact Ann at ann.fusion@gmail.com to set up personalized instruction to accomplish specific projects using kiln work, casting, pate de verre, and more. The following classes are on Saturdays from 9:00-5:00 with cold working later in the day on Sunday. Cold working can also be arranged individually if necessary. Reminder–these classes are at the new rate of $265. Canceled May 16 2014: Circle of Friends Gallery, Bend Oregon. Landscape classes Friday with cold working completed on Sunday. Circle of Friends Gallery is located in Tumalo OR (near Bend). Contact Jae at the gallery for times, cost, and registration. 541)706-9025 info@circleoffriendsart.com Click this link for a description of prior classes Ann has offered at Circle of Friends. November 10th and 11th, 2012: Beginning Landscape in the Battleground Studio. Previous glass working experience required. Cost: $200, includes materials, firing, and cold working. This class is full. Day one includes laying out your project to be fired, and Day two involves cold work to finish your piece. January 18th: (THIS CLASS IS FULL.) Beginning Landscape in the Battleground Studio. Previous glass working experience required. Cost: $225, includes materials, firing, and cold working. Day one includes laying out your project to be fired, and Day two involves cold work to finish your piece. January 25th: Open Studio Day. Students who have taken a class from Ann previously can sign up to use the studio. Includes access to glassworking tools, the kiln, and Ann will be available for assistance. Cost: $100, with an additional $10/lb for glass. Must have taken a class from Ann previously. January 19th-20th: Beginning Landscape in the Battleground Studio. Previous glass working experience required. Cost: $225, includes materials, firing, and cold working. Day one (9:00 AM – 5:00 PM, approximately) includes laying out your project to be fired, and Day two involves cold work to finish your piece. January 26th-27th: Beginning Landscape in the Battleground Studio. Previous glass working experience required. Cost: $225, includes materials, firing, and cold working. Day one (9:00 AM – 5:00 PM, approximately) includes laying out your project to be fired, and Day two (beginning at 3:00 PM, unless specific schedule needs must be accomodated) involves cold work to finish your piece. February 9th-10th: Beginning Landscape in the Battleground Studio. Previous glass working experience required. Cost: $225, includes materials, firing, and cold working. Day one (9:00 AM – 5:00 PM, approximately) includes laying out your project to be fired, and Day two involves cold work to finish your piece. February 22nd: Open Studio Day. Students who have taken a class from Ann previously can sign up to use the studio. 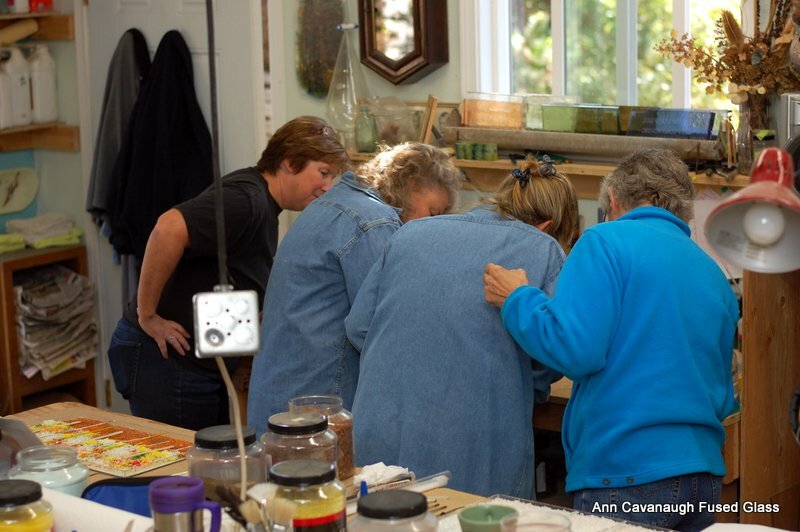 Includes access to glassworking tools, the kiln, and Ann will be available for assistance. Cost: $100, with an additional $10/lb for glass. Must have taken a class from Ann previously. February 23rd-24th: Beginning Landscape in the Battleground Studio. Previous glass working experience required. Cost: $225, includes materials, firing, and cold working. Day one (9:00 AM – 5:00 PM, approximately) includes laying out your project to be fired, and Day two involves cold work to finish your piece. March 2nd: 10:30 AM-4:30 PM at the TAW Gallery in Bend, Oregon. Previous glass working experience recommended. 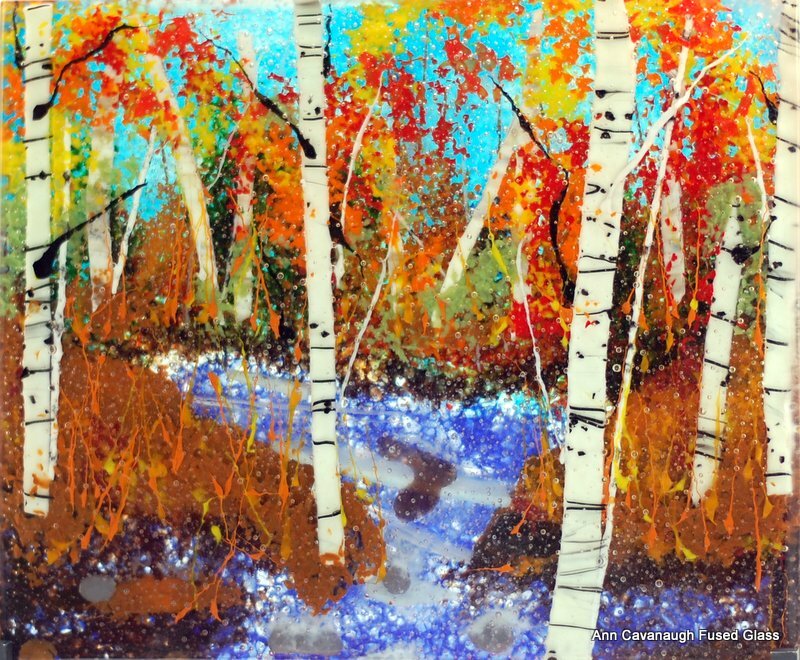 This class allows for students to explore the creation of thick landscape pieces using a variety of techniques and materials. Students should bring or will select a landscape photo to inspire their work. Students will create an 8×10 inch piece. This will be Ann’s only class at TAW this winter. The cost for this class is $275.00 and includes instruction, firing & materials. Register with the TAW Gallery here. Sept 20-21–Circle of Friends Gallery (formerly TAW Gallery), Bend Oregon. For more information and to register, contact Jae Yost 541) 706-9025 . Ann, I need to get a hold of you about the Oct. 26 class. I called about june 6 and 7th classes. making sure you goy my message.